The most recent innovation deployed in Karnic’s facility is the so called Smart Production Controller with the intent to modernize and improve production. This system is based on the use of computers in all stages of production with the aim to help the staff to perform their tasks more efficiently. At the same time the management is able to monitor and control all production phases with more accuracy plus to administer the inventory and plan purchases. Press release follows. 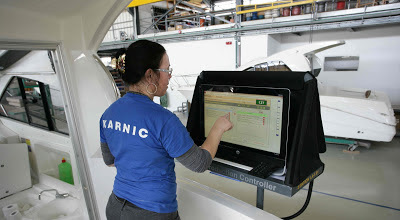 At the beginning of February Karnic introduced a new concept to monitor and control their production operations. The system which is considered novel for the standards of marine industry, is based on the use of computers at all stages of production on the factory floor to instruct staff in a step-by-step approach to perform work tasks, carry out quality control checks and simultaneously record operation times and material quantities. The company already installed the first stations and the system is currently run in an introductory mode to test features and train staff. It is noted that results collected from the first weeks of preliminary operation indicate double digit gains in productivity. 'Smart Production Controller' as the system is referenced within the company, is the result of Karnic's continuous efforts for improvement and the high emphasis given on production efficiency, quality control and productivity. It has been developed in-house to replace worksheets so as information is conveyed as specific instruction packages from the management rather than collected in hand written forms prepared by technical staff. With this system the company is able to define and control with extreme accuracy the operations at each production stage, ensure product consistency under minimal supervision and analyse production or person performance instantaneously at a press of a button. In addition, the system can provide instantaneous indication on parts and raw material requirements, a feature that enables Karnic to administrate inventory and plan just-in-time purchases.